Diversion ahead to the right. Major road joining from the left. 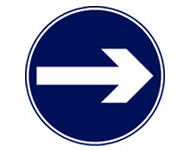 Explantion: This sign tells you that you must turn right, its usually displayed at a junction where all traffic must turn right - for example, in a one way system that incorporates a junction.